The South Australian Law Reform Institute (SALRI) is calling for public submissions on whether there should be a state scheme for recording the location of, or securely storing, South Australians’ wills. The SALRI, located at the University of Adelaide, today issued a paper which examines what is currently available for those wanting to store their will in South Australia, and in other states and countries, and invites public to comment. SALRI Deputy Director, Helen Wighton, says the current court-based facility for the secure custody of wills is almost exclusively used for court-authorised wills and is not designed for accepting a large number of wills. “The only other options for secure storage of wills in South Australia are to make private arrangements (with a bank or solicitor, for example) or to appoint the Public Trustee as executor (who will store the will for you),” Ms Wighton says. Ms Wighton says the main purpose of any such scheme is to ensure that people’s property is distributed according to their wishes as expressed in their last will. “If your will cannot be found after you die, your estate will be distributed according to the rules of intestacy, and will not necessarily go to the people you wanted it to go to,” she says. “We’re looking for submissions from the legal profession, professionals involved in estate administration and the public. The review was initiated by the SA Attorney-General, the Hon. John Rau MP, as part of a wider review of succession laws in South Australia. 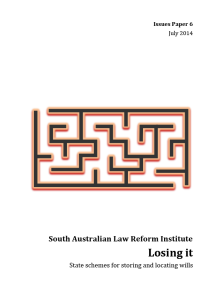 The issues paper, Losing it: State schemes for storing and locating wills, and information about how to make a submission can be found on the SALRI web page: http://www.law.adelaide.edu.au/research/law-reform-institute/.The closing date for submissions is Friday 12 September 2014.